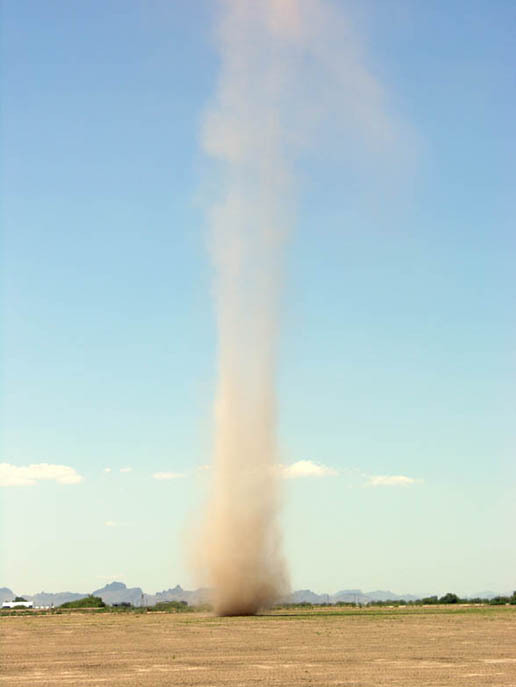 Photograph of a large dust or sand devil in the desert near Eloy, Arizona. This shot was taken on June 10, 2005 by a team of Mars scientists from NASA's Goddard Space Flight Center, the University of Arizona, and the Planetary Science Institute. The scientists joined in an expedition to observe dust devils in an attempt "to better understand the physics that forms and sustains them and to gauge their possible hazards to explorers on Mars" (dust devils have been filmed and photographed on Mars as well !). The next image is another photo taken during the same expidition.